September 2017 was a month that will be forever marked with sadness on the island of Puerto Rico. Hurricane Maria decimated the island, and the aftermath that followed was unspeakable. For Lucy Giboyeaux, it hit particularly hard. Although she is a Cleveland resident, most of her family is from Puerto Rico, and she has many family members still there. She remembers vividly calling to check on them only to find all of the phones were down and waited to hear that everyone was okay. But for Lucy, that time period wasn’t just about helping her relatives find assistance. She had customers that had become family there, depending on her for solutions to their mortuary needs, and they just didn’t know where to begin. The job was, indeed, hers. And the rest was history. In the beginning, selling mortuary shipping services in Spanish-speaking countries wasn’t an easy task. “I learned everything from the relationships I was building. I didn’t know the words for all of the industry terms that we use, so I had to rely on my friends that worked for the businesses I was talking to for the right way to say certain things.” Finally, after about five years of searching, Lucy found a Spanish language book on embalming, and she was able to understand some of the more complicated terms she was struggling with. It wasn’t long until Lucy was the foremost expert in mortuary shipping for many Spanish-speaking countries. She now serves countries in Central and South America and has many customers in Mexico and Puerto Rico. She feels a tremendous sense of pride in helping her customer avoid the frustration that a language barrier can bring for a Spanish speaker. She always wanted to help. And during that tumultuous month of September 2017, she got that opportunity. With no power and limited resources, their son’s remains had to stay in Florida for an extended period. The hurricane wasn’t just causing problems for mortuary clients on the island, it was causing problems in the states too. When those bodies had to be refrigerated for long periods of time, funeral homes were running out of room to store the bodies. Lucy and the team at NMS found a solution by working with crematoriums around the country to accommodate the issue of long-term body storage. Thanks to that type of off-the-cuff problem solving, the body was returned to the concerned family, and they were able to memorialize their son without worry. Being able to speak in the native tongue of a customer helps to relieve stress during a difficult time. For Lucy, it is a service that she is proud to provide for NMS. Each country has different rules in place for handling bodies and embalming. The paperwork is different. When you are a funeral director and you are already struggling to understand the process, you need someone who can speak to you in your language to help get you the answers you need as clearly as they can be delivered. Here at NMS, we deliver to customers all over the world. 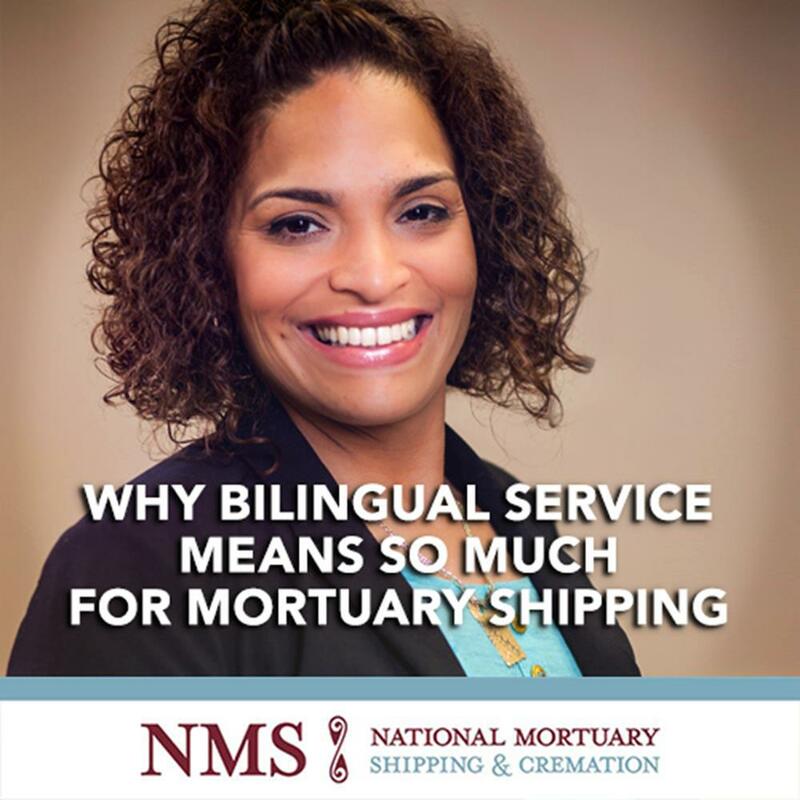 If you are looking for a bi-lingual company to assist your funeral home in taking care of mortuary shipping to any country, contact the team at NMS. We help take care of the details, whether there is a disaster or not, so that you can focus on the families you serve.